Today Mommy’s Little Miracle is featuring Knocked Up Fitness’s Guide to Pregnancy Book & After Baby DVD! Staying fit is so important while you are pregnant. You will feel better, your baby will be happier and your labor and delivery should be easier. They say giving birth is like a marathon, so it should be something you train for! What a great book to have! Health and fitness is something in life that you should not take lightly, and the same applies for during your pregnancy! Although us pregnant ladies love to indulge on those late night Oreo sunday’s or give in to our naughty fast food cravings, maintaining a healthy lifestyle is especially important throughout your pregnancy. I’ll be the first to admit that I am not a fan of working out (especially while carrying the extra weight of a growing child), but lucky for me and all of you other pregnant ladies who would rather relax that work out, Knocked-Up Fitness makes it easy for us to stay active and healthy during pregnancy, and to help kick the baby weight after! Knocked Up Fitness’s Guide to Pregnancy features about 50 detailed and heavily photographed of pregnancy friendly work outs that you can do in the comfort of your own home! Each work out is designed to help you stay fit and healthy during your pregnancy and some may even help prepare you for child-birth! The After Baby DVD is the ultimate resource for getting that pre baby body back, while in the comfort of your own home! It features a variety of Pilates infused work outs that can easily be done while you work around your newborns new routine! To see a full review of the Knocked Up Fitness Guide to Pregnancy Book and After Baby DVD, use this link! 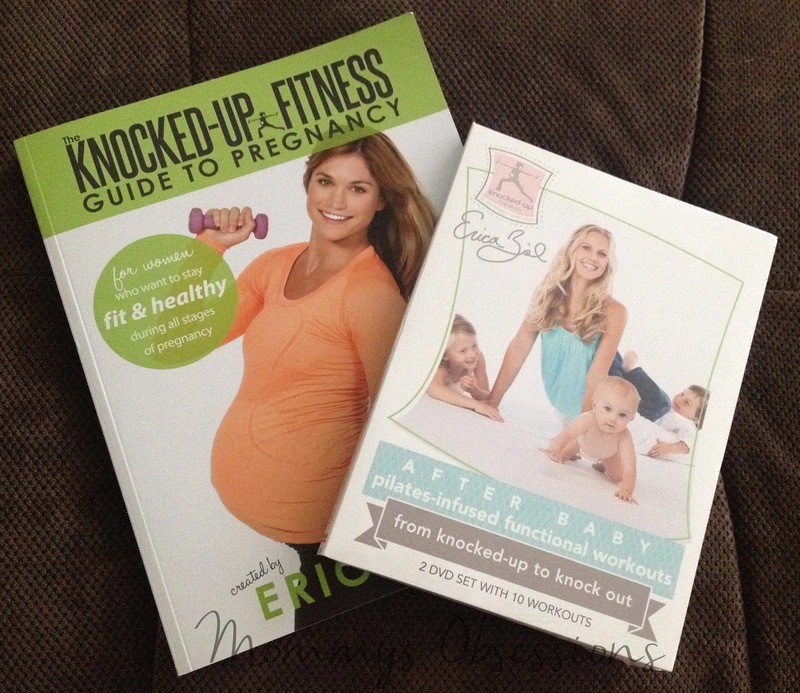 To Purchase: Visit Knocked-Up Fitness’s website and grab your own set of pregnancy and postpartum workout books and DVDs! To Win: Mommy’s Obsessions and Knocked-Up Fitness have teamed up to give one lucky person a Guide to Pregnancy Book and After Baby DVD! The Giveaway will close late on the evening of August 17th. The winner will be chosen at random through Giveaway Tools. The winner will be announced both on Giveaway Tools form as well as notified by email and announced on Mommy’s Obsessions Facebook. Winner must respond within 48 hours of receiving their winner’s email otherwise they will forfeit their prize and a new winner will be chosen. The winner will have their prize sent to them by Knocked Up Fitness. Mommy’s Obsessions and other participating bloggers are not responsible for prize shipment. Must be 18 years and older. Facebook, Twitter, Pinterest, and Google are in no way affiliated with this giveaway. No Purchase Necessary. Void where prohibited by law. US Only. For any questions contact Mommy’s Obsessions. Mommys Obsessions did receive compensation or product in exchange for the promotion of this event. This blog did not receive compensation for the promotion of this event.